Can you believe Tokyo Disneyland has been around for 30 years? That seems almost impossible. To celebrate they are getting three open box figures, that I have to admit, look pretty sweet. I really like the one with the Napoleonic Sea Captain with his telescope. Two great accessories. Each figure will be 1200 Yen and will probably be available near the celebration of the 30th. The first figure celebrates the grand opening of Tokyo Disney and he holds what looks to be a retro park guide. The sea captain represents the grand opening of Tokyo Disney Sea. 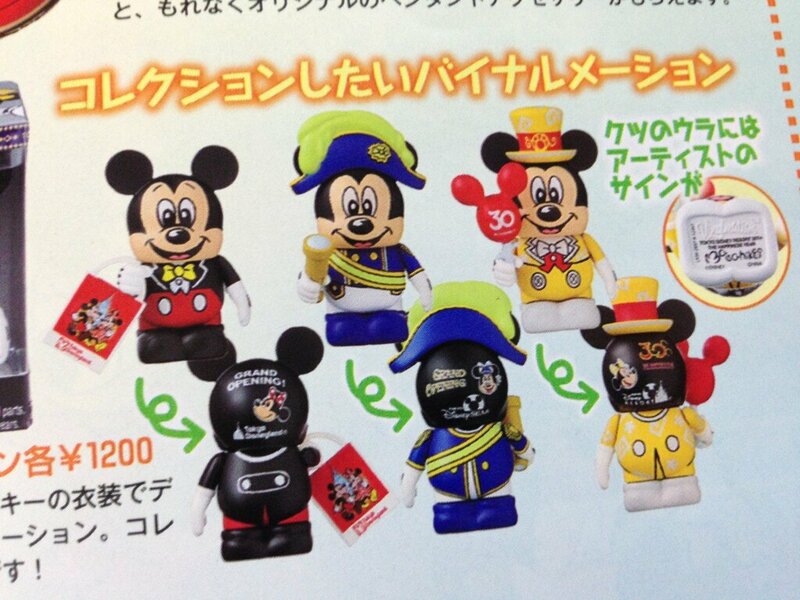 While the third figure is celebration the 30th anniversary with a Mickey balloon accessory. Thanks to vinylmation kingdom and twitter user hicgrape for this picture. Do you think one of the park sets this year will be an all Tokyo set for the anniversary, like WDW and Paris?